HOUSTON, TAXES – While taking the first step on the moon, Neil Armstrong said the historic words that its a small step for [a] man, but a giant leap for mankind. Keeping up with the same spirit of taking giant leaps for mankind, NASA has successfully landed its probe ‘Insight’ onto the surface of our neighbour, the red planet, Mars. 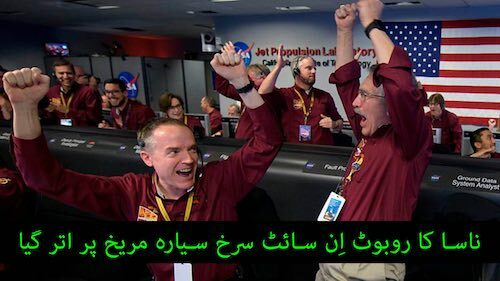 According to details, it is the 8th attempt of NASA to land on the red planet Mars. INSIGHT will analyse the nature of Mars’s interior and evaluate its contents along with similarities between Mars, Earth and Moon. The probe will also evaluate that how the planet was born inside our solar system. One of the core things this probe will investigate is that how similar Mars’s core is to Earth’s core. Where the core surface is solid and the surface around it is plasma. The probe will investigate regarding how similar earth’s and moon’s surface is to that of Mars and how did the red planet born in our solar system. This will also open up possibilities to further investigate regarding any form of life on the planet. The data received from it will help NASA in other projects in which probes are sent to one of the Jupiter’s moon Europa. Space travel has always inspired humans and steps like these only take us further in our species’s journey to unravel the mysteries of this universe.